The Toddler Room is a very loving, nurturing and caring environment and our team understands the importance of this age group for developing a good foundation for all areas of development. What is the day to day routine in the Toddler Room? 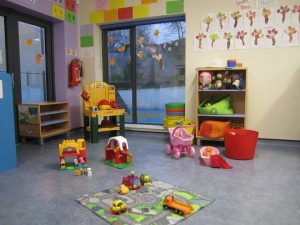 On any given day the Toddler Room follows a schedule that includes snack times, sleep times, stories and nursery rhymes, activities such as dancing, painting and craft, and outdoor play. Our curriculum is flexible and based on our children’s interests in accordance with Aistear and Siolta. Our room enjoys lots of sensory play with sand, water, rice, pasta and foam, which is important for children’s sense of discovery and exploration. Our team provides parents and guardians with a daily report sheet to provide information about your child’s day and any issues that may have arisen. We also make sure we speak to parents at each drop off and collection time. Parents and guardians can now also access up to date information regarding their child's activities and progress with the Child Paths system. What should I send to the Toddler Room with my child? Nappies and wipes, nappy cream, a change of clothes and any special creams or lotions in the event your child suffers from a skin condition. Places in the Toddler Room are offered on the basis of half days (morning session 7.30am - 1.30pm OR afternoon session 1.30pm to 6.30pm) or full days (7.30am - 6.30pm) for 52 weeks inclusive of all mid-term breaks and the summer holidays. For full terms and conditions please refer to the Centre’s Parent Handbook.